If I were a cartoon, I think I’d be depicted walking around, living life, sleeping, with various ingredients and recipe ideas fluttering around my head like a swarm of butterflies. With all the cooking magazines, cookbooks and social media feeds I browse, these butterflies carry ingredients, methods, and techniques and often collide into what eventually becomes our next dinner. And that is exactly what happened last night. It started with a slow stroll through Whole Foods looking at produce and pondering a couple meals for the week. I passed some sweet potato hummus and was tempted to get it for an afternoon snack, but I hate buying hummus because it is so easy to make. I just usually never make it. But I was determined and I picked up a sweet potato and a couple cans of garbonzos. Then I went home. I cooked the sweet potato in the microwave and then put it on the counter to cool only to find it still there as I was rushing out of the house to pick up my daughter. So I threw it in the fridge and forgot about it until the next day. Somewhere in that time frame I had read a recipe for a creamy chick pea soup that sounded really good. The chickpea and sweet potato butterflies decided to merge ideas and make a sweet potato hummus soup. The rational wife butterfly insisted my husband would not at all be satisfied by that alone so I considered the other items I had picked up at the store. Ground lamb. Lettuce. An orange (which might succumb to death by ignoring as told here if I did not rescue it). All sitting next to some parsley that desperately needed eating and half a lemon. Perfect. I would make some grilled lamb sausage and the creamy soup topped with a gremolata of sorts and a crisp, simple salad. The sausage would be filled with cuminy love that would be a great complement to the chick peas and sweet potato and the orange would be used for zest and juice throughout. Somehow. I would start with the sausage so the flavors had a chance to marry a bit. I started with some minced garlic and was about to start pulling spices out when I remembered the jar of ras al hanout I had made for a different lamb dish. I once again patted myself on the back for having such a wonderful spice mix on hand. If you don’t have such a thing, make it pronto. Then remember you have it and mix it into some meat or lentils or beans. I added the garlic, some ras al hanout, salt and zest from the orange into the meat and cooked a sample. Wonderful. I formed the meat into sausage-like shapes on some skewers and put it in the fridge. For the soup, I cooked some onion and garlic, then deglazed with a bit of wine. I added the chick peas, sweet potato flesh and chicken broth and simmered until the chick peas were very tender. I then blended it all until smooth (oh Vitamix how I pine for you!) and put it back in the pot. It wanted a fair amount of salt and lemon juice which were good, but something was missing. I considered some tahini but decided to use sesame oil instead. That with a hefty dose of cracked pepper did it. As I considered the gremolata I decided to also use a bit of the orange zest I had left as well as the juice. That along with the parsley, lemon zest, garlic, salt, pepper and oil ended up being more of a vinaigrette than a sprinkle, but it was bright and fresh and good. To complete the meal, I grilled the sausages, poured the soup into a bowl and drizzled the gremolata vinaigrette on top. I took a taste and cold, herby sauce was a perfect balance to the creamy, sweet soup. The garlicky, spiced sausage also paired well and a simple salad topped with a squeeze of the orange, a splash of oil and s&p cleansed the palette. I went to grab my drink and returned to see that my daughter had ‘helped’ me by stirring all the gremolata into the soup. While it still tasted good, it eliminated all the fine ribbons of flavors…so I recommend protecting your bowl from preschoolers. Otherwise, it was a hearty and soulful meal with plenty of leftovers. Mix all sausage ingredients and refrigerate until ready to cook. Can be mixed the day before. Can also be grilled a day ahead and reheated. Heat oil in a large pot and cook onion and garlic until soft. Add wine and cook until almost evaporated. Add chick peas and broth. You can either pre-cook the sweet potato in the microwave or oven, or simply peel and cube it and cook it right in the broth. Simmer everything about 20-30 minutes until the chick peas and potato are tender. Blend until very smooth (being careful of the hot liquid) and return to the pot. Season to taste with lemon juice, s&p, and 1/2 t or so of sesame oil. Blend parsley, zest, garlic and juice until smooth adding oil in a stream to emulsify. 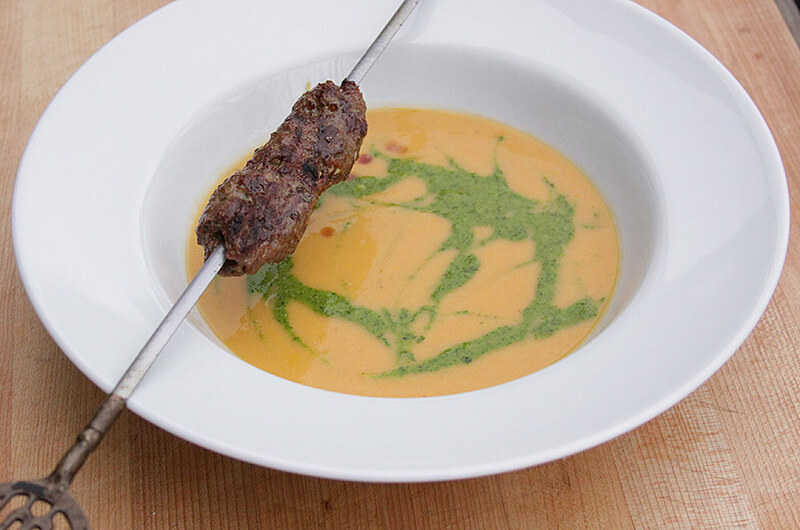 Serve soup drizzled with gremolata and grilled sausage on the side. This entry was posted in Lamb, Meditteranean, Soulful & Simple, Soup by Marina Chotzinoff. Bookmark the permalink.